The development of modern art in Uganda is unthinkable without Margaret Trowell whose Mulago home verandah art classes in 1936 were the beginning of the Makerere Art School. She was a Slade School educated artist who developed a curriculum that was respectful of Ugandan art-making traditions. In 1938, she mounted an exhibition of her students’ artworks in Namirembe Synod Hall, Kampala, which subsequently travelled to the Imperial Institute, South Kensington, London in 1939. Ten years later she installed another exhibition, a survey of her past students’ work in the Makerere main hall who were now working as artists and teachers. 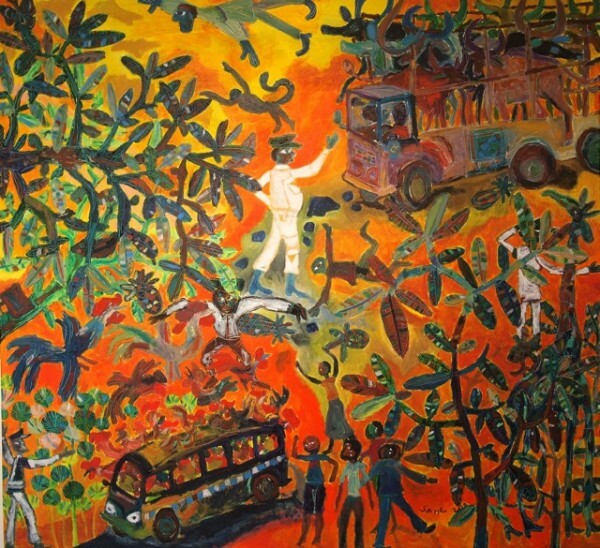 Following the same pattern of a decade earlier, this exhibition travelled to London in 1949 (Kyeyune, 2003). 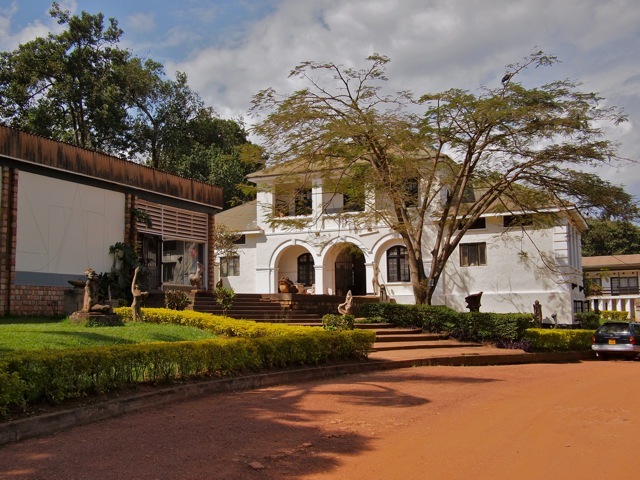 Margaret Trowell School of Industrial and Fine Arts, Makerere University, Kampala. Trowell was concerned to get her students’ artworks into the local and international marketplace and also to gain academic and political legitimacy for the art school she had started. This interface with audiences was the first evidence of a break from the traditional genres practice where art and audience interaction did not necessitate a mediator. For example, a potter who was well-known in his community meant that those who needed his wares dealt directly with him. This new art form was taken through an intermediary where the artists and the artwork were separated taking the art outside the production context and into a separate space where it was supposed to independently articulate its merits. 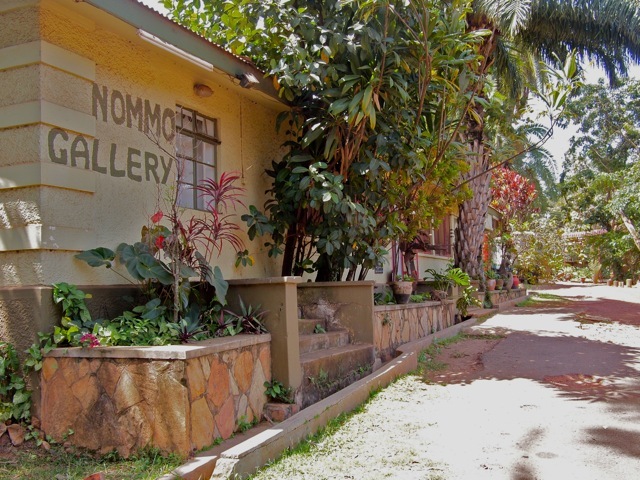 Art galleries eventually opened in Kampala with Nommo Gallery on Kampala Road opening in 1964 as an active art space with a vibrant exhibition program. Modern art in Uganda is also unthinkable without Cecil Todd who problematized the relationship between traditional art genres and modern art. In his avant-garde attempt to supersede traditional art forms, he represented the most argued pursuit of modernity and rejection of African traditions (Kyeyune, 2003: 123). He too saw a need to mount exhibitions in order to exhibit students’ and lecturers’ artworks thereby opening the Makerere Art Gallery in 1969. Lecturers at the art school then included Jonathan Kingdon who was instrumental in running a varied program to support the teaching and learning. The tumultuous political circumstances of the 1970’s and 1980’s saw a total disappearance of gallery activity where artists fled into exile, stopped making art altogether, or were compelled to turn to batik-making due to scarcity of art supplies. Batiks were cheaper to make and were not in the art canon so they were mediated through craft shops and familial and social networks. With relative political stability since the 1990’s, an economic environment conducive to investment, an emerging Ugandan middle class with changing tastes, as well as an inflow of foreign investors, development organizations and foreign missions, the number of people with an interest in the arts is growing. This has led to more art galleries opening including The Gallery Café in 1993, Nnyanzi Art Gallery and Studio, AKA Gallery, and AfriArt Gallery among others. Until a dozen years ago, Makerere Art School and Art Gallery were a nucleus around which most artists revolved in the theatre of alliance and rejection. Margaret Trowell’s influence is renowned and her ideas of inclusion of local art genres were loved and hated in turn by successive generations of lecturers and students. When art departments in Nkumba and Kyambogo universities started offering terminal qualifications in art as a discipline independent of education or commerce, Makerere was no longer the centre of art education. However, there is still a discernible similarity in focus because it is often the same lecturers that now teach in the many art schools cropping up. Individual styles are discernible in the art of most mature artists like Rose Namubiru Kirumira and are distinct in their references to Uganda’s history while simultaneously showing international influences. However, among the younger artists some common features are shared, including primary motifs like fish, wildlife and spirals. Startjournal.org interviewed Rose Kirumira two years ago. 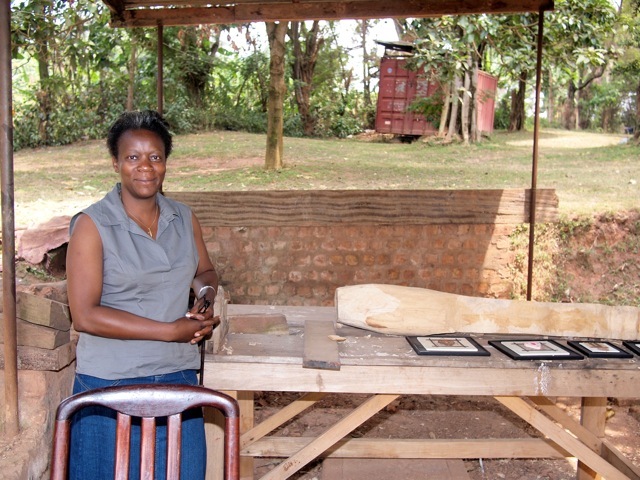 Rose Namubiru Kirumira at her studio at Makerere campus. Some art is more concerned with addressing the individual in an introspective viewing, while others like Maria Naita in her ’maama yampa ne taata yampa’ painting series of 2008 and Lillian Nabulime tackling HIV/Aids awareness among women, are concerned with addressing the group, among whom it catalyzes conversation engaging the shared memories of the country’s history. Read Angelo Kakande’s essay on Lilian Nabulime’s art here. The visual language is both spectacularly bright as in the paintings of Anwar Sadat Nakibinge, and muted as in the bark cloth tapestries of Ivan Yakuze. The traditional genres of art also appear in such duality with the pale brown baskets and brown bark cloth of the Baganda to the brightly coloured baskets and mats of the Banubbi. Some artists capture the present, chronicling social issues that have passed the test of local relevance by circulating through the journalistic media, social networks and international policy. For example, Eria Nsubuga Sane’s commentary on the Mabira forest deforestation threat of 2011; Fred Mutebi on corrupt politicians sucking the country dry; and the dangers of female genital mutilation captured by Stella Atal in her fashion performance pieces. 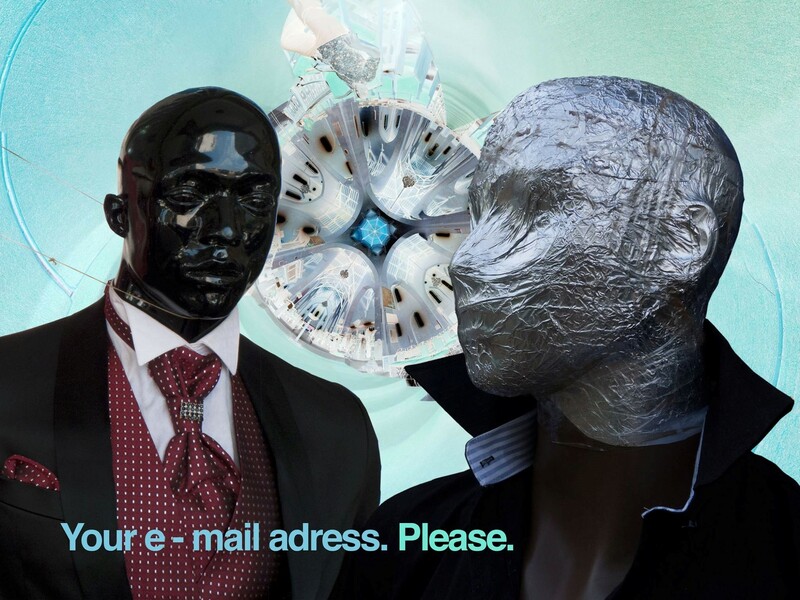 Eria Nsubuga Sane’s exhibition was revied in startjournal.org one year ago. Artwork by Eria Nsubuga ‘Sane’ 2011. 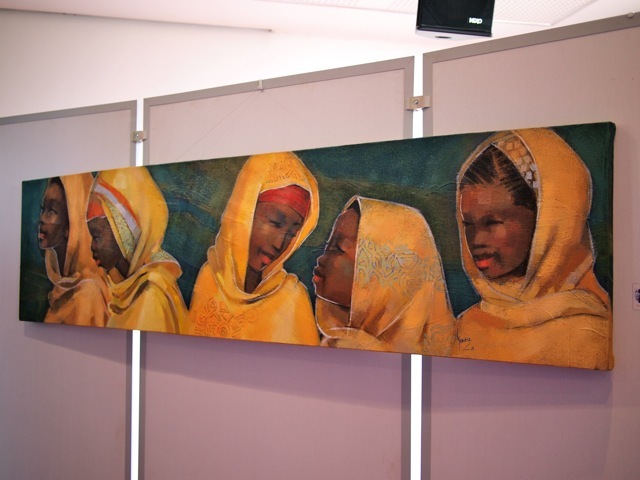 Art is mediated through commercial art galleries like the AKA Gallery; educational institutions like Makerere Art Gallery, the Uganda Museum and Nkumba Art Gallery; artist-run spaces often in shared art studios like Karibu Arts in Kamwokya, and solo home studio display areas like Sanaa Gateja. Startjournal.org interviewed Sanaa Gateja two years ago. In the rush to exhibit the profuse production of art in Uganda, the critical content of the art threatens to be lost without consistent cataloguing, historicizing, and theorizing of the art, activities and relationships surrounding it. Since the nineteenth century, Kampala has thrived as a centre of Uganda’s political power, commercial and administrative activities under the leadership of either the Baganda in the Kibuga, Mengo, the British colonial project, or the independent state government. Kampala is a city of possibilities when people can make their mark or not, but continue to try. The primary values of hard work, perseverance and creativity are evident in Katwe’s inventive welders; shrewd traders in Kikuubo; the vibrant education sector and the wider business community. This is evidenced in Samson Senkaaba’s ’Kampala ssi kibuga kya ba fala’, 2003 poetry performances and mass-produced poetry-emblazoned T-shirts. Artists have tended to concentrate geographically around Kampala finding space for solo and collaborative work. This highlights the importance of the city as a place for vibrant economic, political and creative processes, where artists feed off of each other’s creativity and their analogous practice validates them all while seeking viewer responses. Few Ugandan artists have acquired international renown, and those who have, like Francis Nnaggenda are unknown outside a small circle of specialists. The artists produce mainly for an art market of expatriates temporarily living in Uganda, and very minutely for the political and economic institutions of Uganda, as well as a few wealthy Ugandans. It is therefore apt that the KLA ART 012 is starting off in this city highlighting the strategic role of informal environments for art. The collaborative approach to working that artists have been drawn to for years, is the same approach that arts institutions are now taking in order to attract more and varied audiences for the arts through a multi-location art festival in Kampala: KLA ART 012. By pooling their curatorial vision, organizational skills and good relationships with artists, a public display of art is a way to prompt new art unfettered by financial anxiety, and to catalyze discussion about art among people who would not normally access a gallery. This collaborative act shows us that the values of community and hard work still survive. Often the encounter with art in a gallery setting has the audience as passive recipients of the art on display. KLA ART 012 chooses to transform the viewer from onlooker to participant in the art process by placing the art containers in publicly accessible non-traditional spaces for art to easily reach the pedestrian viewer. The projects are of a social commentary and interventional nature, proposing to address urban problems such as potholes illustrated by Ronex Ahimbisibwe. Startjournal.org interviewed Ronex a year ago. Artwork by Ronex at KLA ART 012. 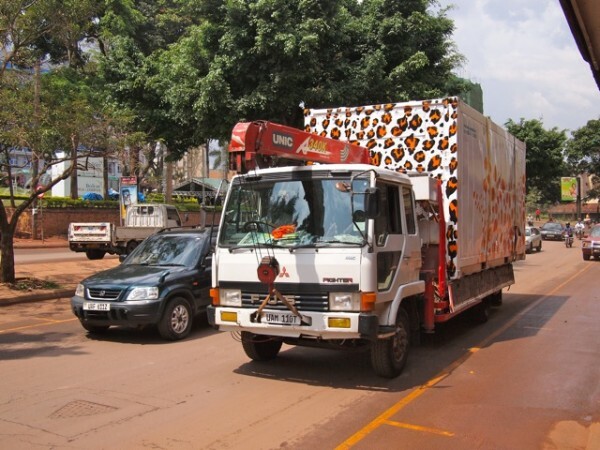 The containers in which ’12 Boxes Moving’ is installed, are familiar to Ugandans as they have ubiquitously served as converted living and work spaces where a whole business area in Kampala was named after them — Container Village near the old taxi park. 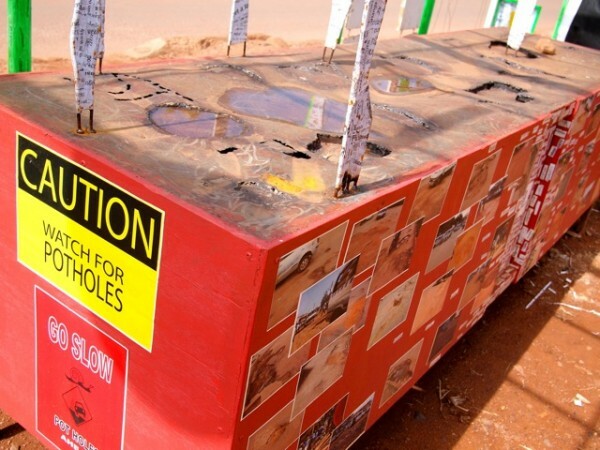 Yet ’12 Boxes Moving’ are encountered in unexpected places like near the Mukwano roundabout. KLA ART 012 was reviewed in the last issue of Startjournal.org. Art exhibition space on the move. Artwork by Waswad, KLA ART 012. Artists need time, working space, materials, supportive family and friends, and audiences. But above all, a culture that respects the skill and intellectual rigor that goes into making art, one that values a multitude of creative endeavors, in order for them to succeed in giving voice to those characteristics of life that words alone cannot express. Interactivity is encouraged in the curatorial stance where it is hoped that visitors to the art containers will engage with the unique artists’ ideas adding them to the knowledge base they already possess. This collaborative initiative, although initiated by art institutions, is contributing to the de-centering of art galleries, the questioning of what art could be, relationships in art processes and dissemination, but most significantly the recognition of audiences as varied types of people and central in the conversation with artists and art. This references back to the practice in traditional art genres where audiences are central as in the Luganda saying ’Omuweesi ekyamuzimbya ku kkubo, kulagirirwa’ — the reason a blacksmith established his practice by the thoroughfare is to be guided. Kyeyune, George. 2003. Art in Uganda in the 20th Century. Unpublished PhD thesis, SOAS, University of London. Margaret Nagawa is a Ugandan artist, independent curator and PhD candidate at Margaret Trowell School of Industrial and Fine Arts, Makerere University, currently living in Addis Ababa. This article was originally written for and published in the Official Catalogue of KLA ART 012. Want to learn more about the Ugandan visual arts scene? Well captured Margaret … Thanks!